René Moore and Angela Winbush got together in 1980, both professionally and romantically. 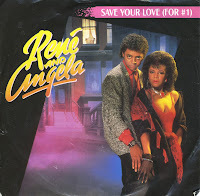 They formed the duo René & Angela and released three albums between 1980 and 1985. 'Save your love (for #1)' was released as the first single from their third and last album, 'Street called desire'. The single gave them their first international success: 'Save your love (for #1)' reached number 21 in the Dutch Top 40. A year later, their marriage fell apart, with the duo falling apart not long after.